I was looking through my Delicious bookmarks the other day and came across this. I probably bookmarked the mouse hand warmer for its novelty factor but with winter around the corner, it didn’t seem like a bad idea after all. However, I certainly would not fork out $20 for it, especially since it looks so easy to make. And so I sewed my own mouse hand warmer quilt! 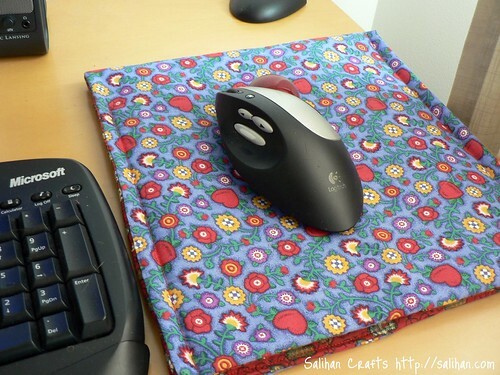 On any regular day, this mini quilt looks like a pretty mouse pad and somewhere soft to lay my wrist on. But when the temperature drops, I can easily slip my cordless mouse and hand INTO the quilt! My hand stays warm and toasty for hours, making me one happy surfer. I’m suspecting you’re laughing your heads off now. I know Richard did when I showed him my mouse quilt. He said it’s the most ridiculous thing I’ve made yet! 😆 Even if you just had a good laugh from this, it would have made my day. Anyway, I also left a little opening for a corded mouse and use a non-slip mat underneath to stop the quilt from sliding around. I’ve written up some simple instructions below. 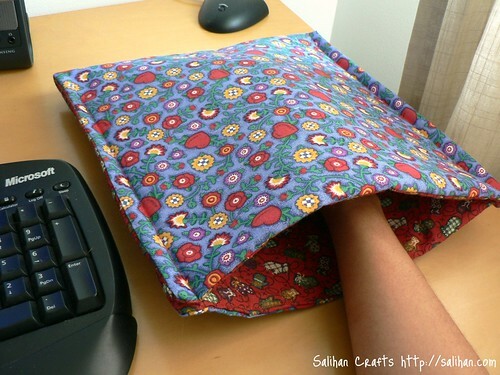 Cut two cotton fabrics and batting to measure 12.5″ wide and 24.5″ long. Place the 2 fabrics together with right sides facing. Place batting on top of the fabrics. Using safety pins, pin the quilt sandwich in place. Sew a 1/4″ seam all the way around, leaving a 4″ opening on one short side. Clip the corners and turn inside out through the opening. Use a skewer, chopstick or something similar to poke the corners out. Give it a good pressing. Fold the whole piece in half and press again. Sew the 4″ opening closed. 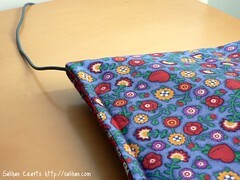 Referring to the above pictures, sew a 1/2″ seam down two sides and leave a 2″ gap in one corner for the mouse cord. So there you have it! I hope that’s clear enough. It’s just a simple quilt for your mouse and cold hand to slip into. Happy days! Considering how cold my hand is now I am SO not laughing at this. I am definitely going to make one asap!! It’s lie when you try read in bed in winter – that one hand sticking out always gets so cold! .-= Steph´s last blog ..Crafting from the stash =-. that’s such a great idea!! I need to do that for my office desk in the winter, for sure. .-= Julie´s last blog ..Modification Mondays: West Hill =-. I think yours is MUCH cuter than theirs! It’s a great idea and so easy to make too. .-= Katie´s last blog ..WCB: Puddy, Featuring a Box =-. At first I cracked up but then I thought back to last winter when it was FREEZING I draped a handtowel over my hand. Seriously. I could totally see myself using this. Thanks so much, I’ll be linking. my hands get SO COLD when I work on the computer!!! this is definitely what I NEED!! genius. I am not laughing because my “mouse hand” is always cold! This is a great idea! 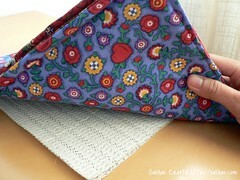 .-= Jane´s last blog ..WIP: Citra-Solv on Patterned Fabric =-. .-= J´s last blog ..Knitting Looms and Kitty kisses =-. I bought one that looks like fish, lol. But I would prefer a softer one like yours. .-= Renanda´s last blog ..Give your hair to help the Gulf =-. That is absolutely AWESOME – and something I need to make. Immediately. I laughed, too, but I mostly think it’s awesome! .-= CitricSugar´s last blog ..Atmospheric Phenomena =-. .-= Donna´s last blog ..Absence =-. I have nerve damage on my right side and I have episodes of severe pain, especially my hand. Keeping something soft and warm on my hand helps, particularly when I’m on the computer. I’m going to make one of these and line it with Minky! Plus it will be P-R-E-T-T-Y!!! Thanks so much for this wonderful idea! .-= Nadine´s last blog ..We Are SEW Lucky We Can Sew! =-. thanks SO much for making it easy for me to surf warm-handed! I’m not laughing either! It’s a great idea and so easy! Now if I can just get good enough at touch typing to do the same for my keyboard. (if the kids in 3rd grade can type under a cover, so can I, right? .-= martha brown´s last blog ..Sweet Paul =-. Oh I love it! My previous co-worker and I used to joke that we needed hand/ mouse warmers so that we could still function in the freezing cold office. Now I will just need one for my keyboard! !